Summerbrooke home sales have really kicked in during the past three months. The year started off very slowly for this popular NE Tallahassee golf course community. When I posted the previous Summerbrooke Housing Report, I noted that only 3 home sales had closed through April. Considering this was typically one of the top 10 most active communities in Tallahassee, something was wrong. Well, things have righted themselves. There were 7 closings in July and 8 in June. We expect low interest rates will keep this neighborhood selling homes, as it features high demand executive homes in an affordable golf course community in the popular 32312 zip code. In this report, we will look at long term average home price trends, value trends, and size trends of homes sold in Summerbrooke, as well as all current listings in the Tallahassee MLS and all closed home sales going back to 1991. It is important to note that the narrative contained below is for sales through December for all previous years, but through July in 2015. The graphs and the closed sales table will be continuously updated into the future (meaning bookmark this page if you always want to know the current status of homes in the Summerbrooke). Current home prices are about 6% higher than they were last year. 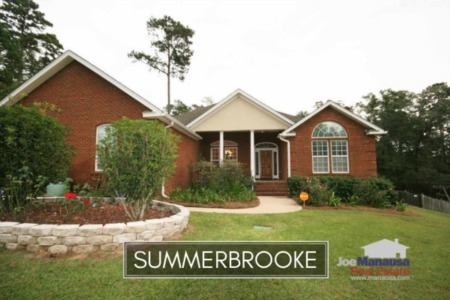 The average recorded home price for Summerbrooke in 2015 thus far has been $358,200. Home sales activity has been feverish over the past 75 days. Through the writing of this report, there were 22 closed home sales in Summerbrooke. If this current pace continues to the end of the year, it would result in the most home sales in Summerbrooke since 2006. Average home values in Summerbrooke declined slightly in 2014, but have recovered in 2015. When you look at the graph below, you can see that Summerbrooke home values have remained very stable since 2013. As long as seller's don't get greedy, they are able to sell. Currently, Summerbrooke home values are just 4% higher than the 11 year low established in 2012. If you've been thinking about buying a home in a golf course community, this is an excellent time to find a great value in Summerbrooke. 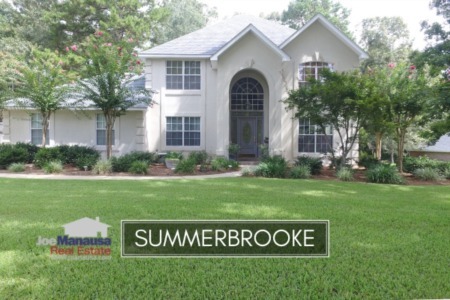 Through July of 2015, the average value of a home sold in Summerbrooke has been $126 per square foot. The average home size sold in Summerbrooke typically falls in a range of 2,600 to 3,200 square feet, and this year is no different. The 22 home sales in 2015 have averaged 2,860 square feet, meaning buyers are choosing homes in the middle of this range. The following list of homes are the most recent listings in Summerbrooke. The following list shows home sales going back to 1991 in Summerbrooke. I hope you enjoyed our Auguest 2015 update on home sales in Summerbrooke, please feel free to drop me a note if you have questions not covered in this report.